Today I would like to share with you a trick that I learned about how to season a cast iron pan. Some of you might have read my older blog post about a Chantal cast iron pot review which has been very popular so I have decided to open up my cast iron horizon for you even more and share this beautiful tip how to create a non stick cast iron pan. So what is the reason you might want to season a cast iron pan? Quite simply, this process creates a stick-resistant coating using oil. 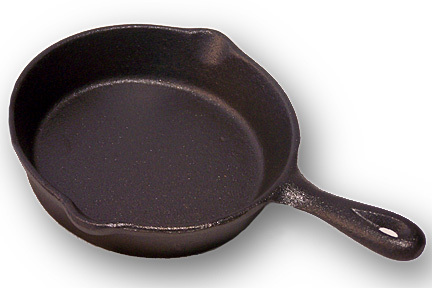 Imagine a layer of vegetable oil or animal fat is cooked onto the cast iron pan. Once this layer is there, it protects your wonderful cast iron pan from rusting. More importantly for me, it gives my pan a non-stick surface and gives me a piece of mind that the iron of the pan will not react with the food I make. Some of the best chefs recommend this process and they like to repeat it once a year. When you buy a cast iron pan that is not already pre-seasoned or if you use your pan and forget to season it or dry it well, you need to season it up. And here I am going to show you how to season a cast iron pan step by step. If your iron skillet has any rust, it is really important to scrub it well. What do I scrub it with you might ask? Well a great solution would be to use hot soapy water! Here are the precise steps how to do this. 3. Pout a little bit of canola oil on the surface of the cast iron pan and smear it all over (it is good practise to do the handle of the pan as well as the bottom). 4. Put the cast iron pan into your pre-heated oven for a couple of hours (250 degrees) but make sure you place it on a cooking sheet and turn it upside down on the over rack (this ensures that if there is any oil that concentrates in the middle of the pan, it will drip off). 6. After you bring the cast iron out of the oven, wipe it out again with a paper towel or a cloth (this gets rid of some of the excess oil) and voila! - When you cook with a cast iron pan, it is very important not to use any harsh detergents to clean it as this process would take the seasoning off and you would have to repeat the process all over again. - After you wash the skillet (in a mild soap), dry it, put it back on the stove, turn the stove on warm temperature(and again what this does it opens up the pores), make sure the surface is dry and now it is ready to go and it will never rust!